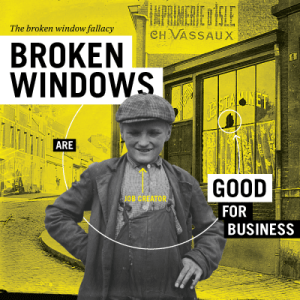 Broken Windows are good for business. ●	A man who has $100. ●	The punk kid decides not to be a punk, leaves the window unbroken. ■	How ever he wants. ■	He buys groceries. The grocer makes money. ■	The grocer saves the money. Now the money can be lent to someone who wants to start a new business. ●	It creates a domino effect of money moving through the economy. ●	But! On net, society is better off to the tune of one window, and the market is more true to the desires of the society. ○	A punk kid throws a rock through the mans window. ■	How does the man spend his $100? ●	He pays the glazier to have the window replaced. It creates a domino effect of money moving through the economy. ■	Summary: The man has a replacement window, and less money. ■	Who benefits when things are destroyed? ■	When insurance companies fix things, premiums go up for everyone. ■	When things get destroyed, your tax dollars are spent. ●	Now you have less to spend on apps you really want. ●	In war a city is destroyed. ○	Without a war, there are opportunities for the same resources to be applied to more fruitful purposes. ○	Instead of rebuilding a destroyed city, the resources could have been used to improve and enlarge the city or build a brand new city. Production, not destruction, creates prosperity.